Liam Neeson. Aidan Quinn. Stephen Rea. Alan Rickman. Julia Roberts. Biopic. Drama. True Stories. Politics. 1900-1919. 1920s. Revolution. Empire. Thriller. War. Historical. Venice Film Festival Best Film. Recommended. Liam Neeson surpasses himself with his portrayal of the legendary Irish folk hero in this stirring historical drama. 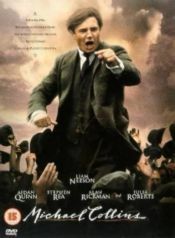 The controversial patriot's life, from his advent after the Easter Rising to his untimely death, is vividly depicted by a sterling cast in this passion-packed biopic. Excellent.